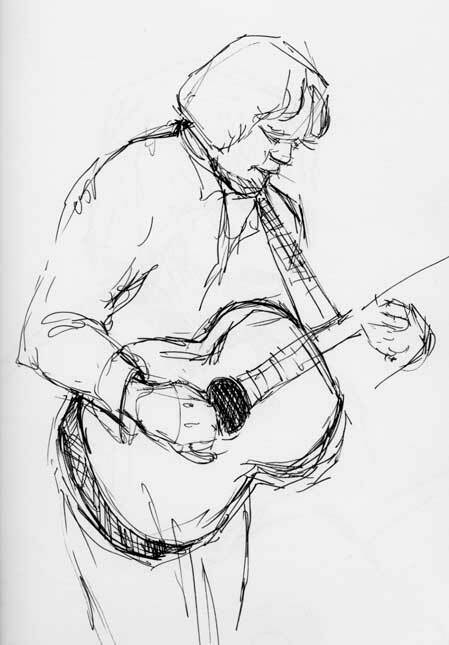 Sketch of Beppe Gambetta while he played lightning fast flat-pick guitar licks. Yesterday I had the pleasure of seeing flat-pick guitar player Beppe Gambetta in concert. It was a small venue, and I was fortunate to sit right up front, thanks to friends who arrived early. I was so stunned by Mr. Gambetta’s playing that I couldn’t even think of drawing for the first half of the concert. But of course I had a sketch book (It was the 11″ x 14″ Cachet, far too large for unobtrusive concert drawing. Reminder to self: bring something smaller to concerts.). I swallowed my sketching-in-public shame during the second half of the concert and drew (still amazed and enchanted) while Gambetta played. You can’t draw musicians without drawing their hands, yet hands are so difficult to draw. And the hands of a musician are always moving (Gambetta’s left hand sometimes blurs against the neck of the guitar). But I’ve found that even a mass of lines can lead me to a better understanding of the subject. And when I draw something I have a better understanding of the whole thing, music included. 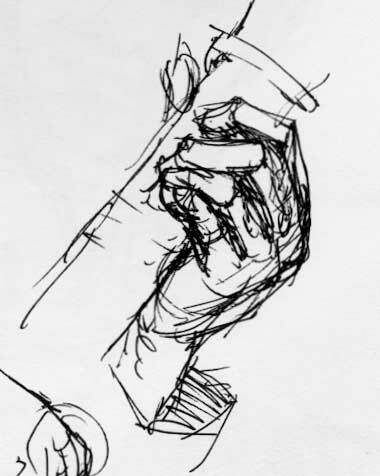 The first time I drew Gambetta’s hand, I tried to record the position of the fingers and knuckles, and the angle of his hand as it wrapped around the neck of the guitar. I imagined the fingers as little boxes, with tops, bottoms, and sides, to help me figure out the planes of each digit. 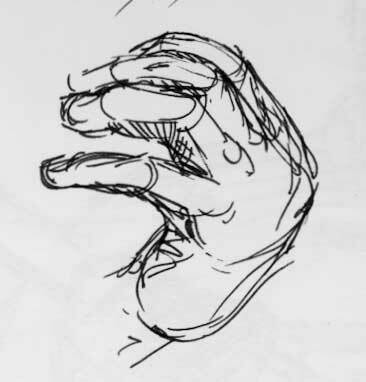 But it’s not easy; since his hands are always moving, I had to devise a way to make a gesture drawing that was accurate. First, I listened a bit to understand the structure of the tune. Then I chose a chord that he made often. 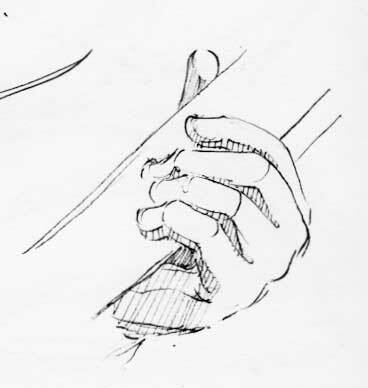 Since I could anticipate when he’d return to that chord, I was ready to draw when he got there, and I quickly sketched as he played with his hand in that position. In my second attempt, I wanted to smooth out the lines and make the drawing less about boxes and more about fingers. I was also trying to figure out the position of his hand and how the fingers attached to it. Later, I studied my sketches and made the drawing above. It’s neater, and shows each finger and the hand position as it wraps around the guitar. It doesn’t show the passion that Gambetta puts into his chord hand; the initial scribble at the top of the post does a better job at that. But this is work that needs to be done; it will eventually make my initial sketches better. 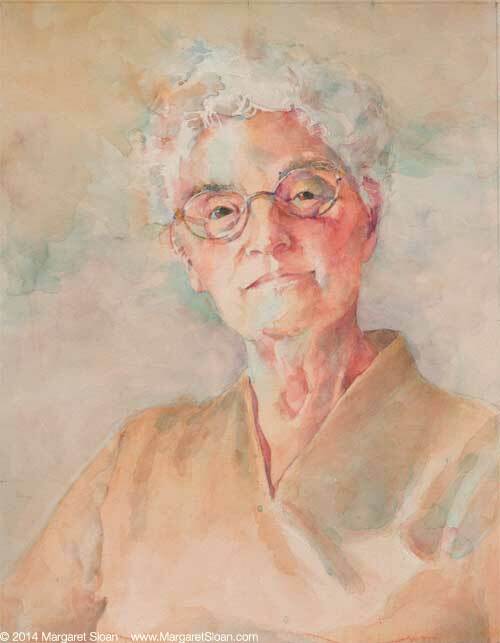 The more an artist learns about a subject, the more force they can bring to even little things like a quick sketch. It’s all about observing, paying close attention, and then attempting to show what you’re feeling with pen and paper, brush and paint. What better way to live a life? And here are some YouTube videos of Beppe Gambetta. Seriously. What better way indeed. Woopwoop! Thanks for letting us inside your thought process. I always find your posts helpful. You’re welcome, and thanks. I write to try and solidify my thoughts about painting. I’m glad if it can be of use to you.